No one ever intends to develop a problem with alcohol. People start drinking at different ages, and for different reasons. But for many people, it can become a serious issue. So how can you know if you have a problem? There are actually certain signs of alcoholism that can help you identify whether things have gotten out of hand. Let’s take a look at some signs of alcohol abuse that will alert you to the fact that it’s time to seek help. Many alcoholics are functioning. However, there are some signs of alcoholism you shouldn’t ignore. Learn more about how to determine if you are addicted here. Keep in mind that withdrawal is not the same as having a hangover. Withdrawal is your body’s reaction to the lack of alcohol rather than too much alcohol. This reaction can cause you to feel anxious, nauseous, depressed, irritable, or tired. You might also experience shakiness, trembling, or have trouble sleeping. Many people with a drinking problem will notice trouble with relationships such as friends or your significant other. Relationship trouble is a major sign that your addiction is beginning to deeply impact your life. Do you feel the impulse to drink all the beer in the house or finish a bottle of wine once it’s opened? This can be a big red flag that you have a problem. 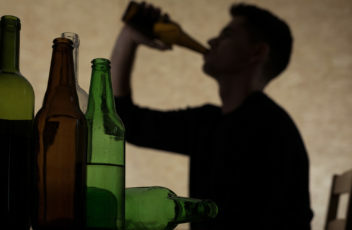 Tolerance of alcohol is another key sign of addiction. If you’re able to drink more than you used to without getting drunk, it means that your body has been exposed to alcohol enough to cope with it. Blacking out is when you wake up with no memory of what happened while drinking. Quite simply, this means not only that you’ve had too much to drink, you’ve had way too much. Blacking out once in a while is bad, but blacking out on a regular basis means you need to get help as soon as possible. Many people use alcohol as a way to deal with their emotions. This can be due to anxiety, stress, or any number of other things. But drinking shouldn’t be used a means of self-medicating. After all, alcohol provides only temporary relief and will only serve to make things even worse in the long run. Another significant warning sign that you have a drinking problem is when you begin lying about your drinking, or trying to hide it from the people in your life. You might be in denial that you are suffering from addiction, and hiding the addiction is a way that many addicts choose to deal with the problem. Learning the signs of alcoholism is the first step toward recognizing that there might be a problem. The better you understand the nature of addiction, the easier it will be to put yourself on the path to getting help. The symptoms of alcoholism are easier to spot once you know what to look for. But taking the steps necessary to begin the recovery process requires more than knowledge, it also requires great courage. Click here to learn about addiction treatment programs. © 2014 First Step Addiction Recovery Programs. First Step of Sarasota, Inc. is a CARF accredited, licensed, comprehensive, not-for-profit alcohol and drug treatment rehabilitation center.